Show: All ManufacturersNorth Coast Medical, Inc.Ultra-Optix Inc.
Can't read the small print? That's not a problem with our large selection of magnifiers. We have reading magnifiers in all shapes and sizes. 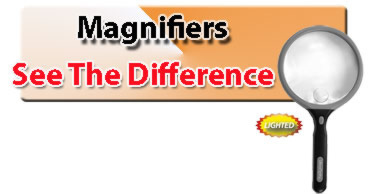 There are magnifiers with lights and ones without. Some magnifiers are hand held while others leave your hands free to do other activities. Our page magnifiers come in flexible and non flexible plastic. We also carry book lights and book magnifiers that attach right onto the book. Don't spend another day not being able to read and do all the activities that you enjoy like crossword puzzles and crocheting. Try one of our reading magnifiers and see the difference it can make in your life.